The end of 2004 seemed even more anticlimactic without a Lord of the Rings to look forward to; score or film. Elsewhere, much of the Oscar bait was a disappointment, but expectations were high for Martin Scorsese's The Aviator, recounting Howard Hughes' prime years. The film itself is extremely good - Leo doing a fine job in the titular role - even if it fizzles a little toward the end, which is somehow surprising as Hughes' decline is perhaps an even juicier story to tell. Maybe the fact that it only hints towards that and tries to end on a quasi positive note is what prevents it becoming great. That or the lack of Cate Blanchett's scene stealing turn as Katherine Hepburn for much of the last hour. Few Scorsese films rely heavily on original score, largely featuring a tasteful collection of songs. There have, of course, been exceptions, notably Elmer Bernstein's wonderful Age of Innocence, but one of Bernstein's last projects was Scorsese's Gangs of New York, which ended unhappily when the director decided against the original score route. 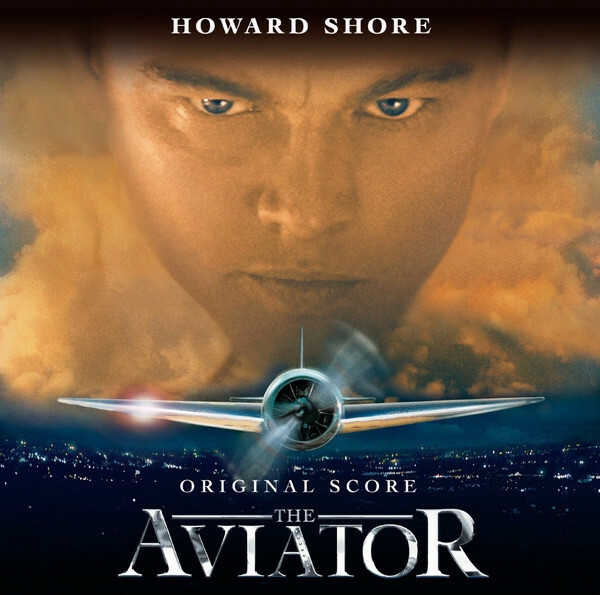 However, a concert piece by Howard Shore was worked into the film which presumably led him to being brought on to The Aviator. It seems a surprise that the score is a Golden Globe winner as very little of the film seemed to contain original score and the most prominent music moments were either of the period and a surprising, but effective use of an orchestral working of the opening of the Fugue from Bach's Toccata and Fugue in D Minor for some of the aerial scenes. Shore's score is striking for its unusual mixture of baroque - an echo of the Bach, perhaps - a rather more terse, but cleanly scored soundscape including some of the sternest and unflambouyant flamenco one could imagine. The aptly titled Icarus opens in fine fugal style with a crisp evocation of flight. The Bach was far more prominent in the film (I suspect several of Shore's cues were replaced), but the original music here form some of the most exciting passages of the album and H-1 Racer Plane continues this trend with running strings and asymmetric brass outbursts. However, a great proportion is rather more low key, with the emphasis on muted, introspective strings. Hughes' mental instability is only subtly suggested and there are no manic outbursts; Shores conveys Hughes' trouble brewing underneath. Rather curiously, Long Beach Harbour 1947, covering the first flight of the Spruce Goose, features the original radio of the event commentary tracked over the top. Unfortunately, it also adds in crackle and sound effects, plus the breathless, non-stop chatter style of delivery so beloved of radio broadcasters and is a disappointing intrusion on one of the score's gently uplifting moments. The Way of the Future mixes the Hispanic with darkly triumphant brass to form a rousing conclusion. In his brief note, Shore comments how the Flemish Radio Orchestra provided the kind of tone he was aiming for and, while the orchestra perform with technical proficiency and with a rich tone, the playing feels just a touch leaden at times. A difficult score to warm to, despite the occasional thrilling passage, but one that is pleasingly unsentimental and discreet while remaining purposeful.